Bought new in June 2010, daily driver with 71k miles. No repairs whatsoever - it has been to the dealer twice to check a hard-shifting automatic transmission, new software loaded but no change to the 1-2 and 3-4 hard upshifts. It's not a deal breaker, just the only issue with this car. It's fast (328 hp), handles very well for a heavy sedan, and is very comfortable with all expected amenities in a luxury car (BT, auto climate, xenon lights, traction and stability control, etc.). Super easy to do all the routine maintenance in my driveway - oil, filters, brakes and brake fluid, rotate tires, etc. The only thing I have not accomplished is changing the transmission fluid - it's not specified and there is no easy drain plug. I'm still working on that challenge. Car handles well on all-seasons (two sets) but really shines on summer tires. I autocross the G37 and hold my own against similar cars. Open differential, being heavy, and lots of body roll work against me but it is predictable in the corners. 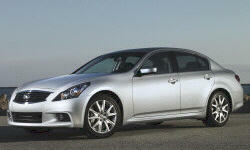 I would defnitely by another G37 - the value of luxury and performance for the relatively low cost is unbeatable. 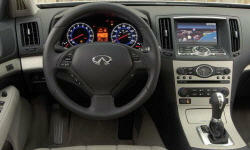 Great rounded looks, I like this generation better than the replacement Q styling. Minimal routine maintenance, no repairs / faliures at all, great Japanese build quality. Just gas and go. Completely reliable and fun to drive.